When you're 39 weeks pregnant, it's time to find out how your baby develops in this last leg of the journey. Plus, read up on possible labor day surprises. Your baby now weighs as much as a pumpkin. At this point, he has shed most of that white creamy substance called vernix and the fine, fur-like hair called lanugo that has covered his skin since the middle of your second trimester. By now your baby has likely reached his birth weight (typically between 6 and 9 pounds) and length (about 18 to 22 inches from head to toe). He's accumulated enough body fat to stay cozy after he's born, and your placenta continues to supply him with nutrients and antibodies that will help fend off illnesses. If you could sneak a peek at your baby's final moments before birth, you'd see that his head is down toward your pelvis (if he's not in the bottom-down or breech presentation, in which case your healthcare provider might suggest a cesarean section). 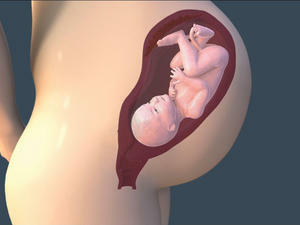 Your baby's body will either be straight up and down, called longitudinal, or positioned at an angle, called oblique. Along with spying your baby's body position, if you could see his head, you'd notice that he's head-down and facing your spine, which is the most common position (called anterior presentation). But sometimes, babies present head-down but facing toward your abdomen. This is called occiput or cephalic posterior. Your baby might lean slightly to one side or the other, meaning that he is either "right" or "left" anterior, or "right" or "left" posterior. 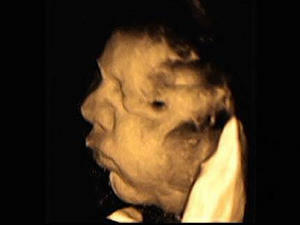 The sonographer is getting a 3/4 view of your baby-to-be's face — and you can actually see his eyelashes! Your health care provider may want to see if the baby has settled into a head-down position, which is the best position for a normal delivery. Less than 5 percent of women give birth on their actual due dates, which means your baby could come a few hours from now or not for another two weeks. But you're probably so attuned to the possibility of labor that every little twinge makes you think: "Is this it?!'" Labor may begin in several ways: mild cramps (the most common scenario), your water breaking, or, if you have a scheduled induction or C-section, a trip to the hospital. Keep in mind that labor has three stages, and when you get to the hospital you'll likely be in active labor (the second phase of the first stage), during which your cervix dilates from 3 or 4 centimeters to 7. Even if you've been imagining for months how your labor will go, chances are it won't go anything like you've planned. For example, your water might break, but if you're not having any contractions, you might need to be induced. Or maybe your labor will progress so fast that there'll be no time for an epidural, even though you were planning on getting one as soon as you set foot in the hospital. Be prepared to go with whatever unfolds. And know that even if you do experience a little delivery-day drama it will all become a cherished and oft-recounted part of your baby's birth story. It's Week 39, and ladies and gentlemen, we've got ourselves a full term baby! This means you have full permission to start giving birth now... If only it was as easy as willing it to so. Nope, the baby likes to come when the baby is ready, and sometimes that can feel like never. You get your hopes up with every Braxton Hicks contraction, only to be disappointed when they go absolutely nowhere. So is there a way to help labor on its way from home? Yes—sometimes. What happens if I can't make it to the hospital? I'm dilated -- will I go into labor today? Though you're 39 weeks pregnant, your baby is ready to greet the world! 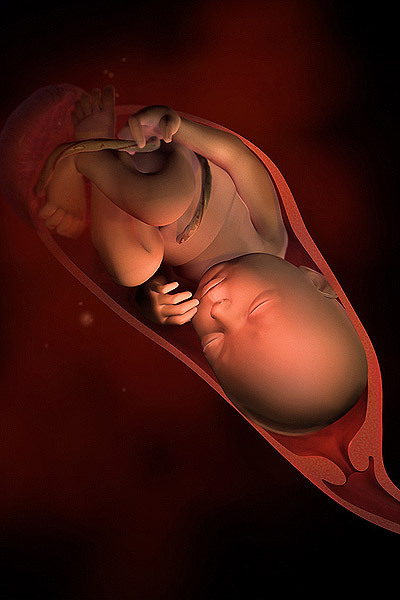 Find out exactly what is going on with baby-to-be during the end of your pregnancy. Find out what's going on in week 39 of your pregnancy on this podcast episode of Pregnancy Confidential.